1. Preheat the oven to 200°C, gas mark 6. To make the aubergine purée, cook the aubergines in a frying pan over a high heat, turning often, for 10 minutes until the skin starts to burn. Transfer to a roasting tin, drizzle with a little oil, season and place in the oven for 10-15 minutes, until soft. When cool enough to handle, remove the skin. Put the pulp in a bowl and mash with a fork, adding the remaining oil, garlic, parsley, cumin, lemon juice and seasoning. Set aside. 2. For the lamb, mix the ras el hanout with the olive oil and a pinch of salt. Warm a large frying pan or griddle over a high heat and sear the lamb, in batches if necessary, for 1 minute each side. Remove from the heat and brush with the ras el hanout mixture. 3. Place the lamb in a roasting tin and cook in the oven for 8-10 minutes for medium rare, or until cooked to your liking. Remove from the oven and leave to rest for 10 minutes covered with foil, then drizzle with honey. 4. To cook the cauliflower, warm a heavy-bottomed pan over a high heat. When smoking hot, tip in the cauliflower florets. Cook for 12-15 minutes, giving the pan a shake every 2-3 minutes, then add the olive oil and ras el hanout, lemon juice and seasoning. Scatter the coriander. 5. Mix the tzatziki ingredients together and season. 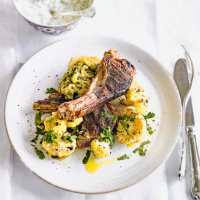 Serve with the lamb chops, aubergine purée and cauliflower.